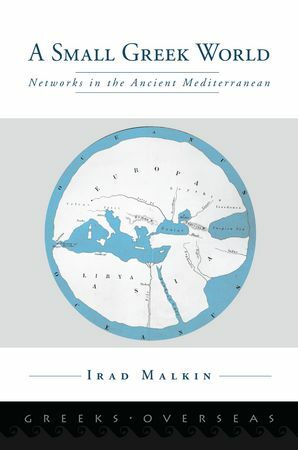 Irad Malkin’s new book ‘A small Greek world: networks in the Ancient Mediterranean’ has just appeared with Oxford University Press. Looks like a fascinating read, seeing Ancient Greek history through network goggles. Visit the publisher’s webpage to order. Irad Malkin will visit Southampton in March for The Connected Past symposium. Greek civilization and identity crystallized not when Greeks were close together but when they came to be far apart. It emerged during the Archaic period when Greeks founded coastal city states and trading stations in ever-widening horizons from the Ukraine to Spain. No center directed their diffusion: mother cities were numerous and the new settlements (“colonies”) would often engender more settlements. The “Greek center” was at sea; it was formed through back-ripple effects of cultural convergence, following the physical divergence of independent settlements. “The shores of Greece are like hems stitched onto the lands of Barbarian peoples” (Cicero). Overall, and regardless of distance, settlement practices became Greek in the making and Greek communities far more resembled each other than any of their particular neighbors like the Etruscans, Iberians, Scythians, or Libyans. The contrast between “center and periphery” hardly mattered (all was peri-, “around,” nor was a bi-polar contrast with Barbarians of much significance. Should we admire the Greeks for having created their civilization in spite of the enormous distances and discontinuous territories separating their independent communities? Or did the salient aspects of their civilization form and crystallize because of its architecture as a de-centralized network? This book claims that the answer lies in network attributes shaping a “Small Greek World,” where separation is measured by degrees of contact rather than by physical dimensions.